The details of the Austrian coalition agreement between the conservative People's Party and the far-right Freedom Party have been revealed. A cornerstone of the deal is to expand voter participation in legislative matters, making referendums more widely available, but it was agreed that a vote will not be held on the country's EU membership. 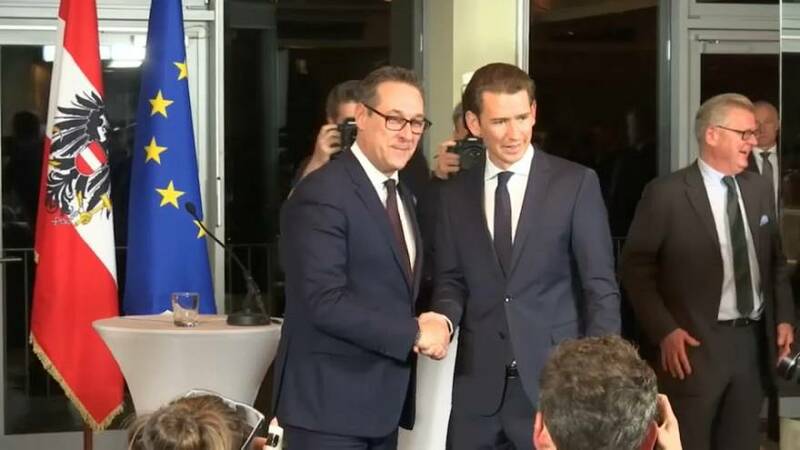 Sebastian Kurz, leader of the Austrian People's Party and soon-to-be Chancellor said: "We have agreed on a clear pro-European course with the goal to strengthen the subsidiarity of the European Union - creating a European Union which is strong in big situations, but takes a step back in small topics." However, while he said that there would be no new taxes put in place, he acknowledged that money needs to be saved. Under the deal, the Freedom party will run the foreign, interior, and defence ministries, giving them control of much of the country's security apparatus. Vice Chancellor-elect Heinz-Christian Strache, leader of the Freedom Party, said: "When it comes to immigration we have clearly stated that we want to stop illegal immigration, but we also want to stop immigration into our social security system." With this in mind, Strache announced his first policy initiative: to slash benefits for asylum seekers to 365 euros. After weeks of talks, the coalition deal paves the way for Austria to become the only country in Western Europe with a far-right party in government. While the Freedom party has reached new heights, of power the People's party will control the influential finance ministry, as well as the justice and agriculture departments.